We understand the importance of providing toxin-free dentistry that takes into account the whole body. We can help your prospective patients understand it as well. Per Google’s search volume data, the first type of person—the one looking for a holistic dentist— is rare. And in areas where there is less consciousness of the benefits of natural treatment, it is rarer still. It becomes vital, then, to foster the other two types of people and create marketing that interests the general consumer looking for a dentist in the many benefits of holistic dentistry. We do this by using market research and scientific marketing techniques. Part of the science of marketing is to change someone’s mind about something. Or to make something that has been unknown or of little interest interesting and desirable. Once that has been accomplished, we direct the prospective patient to contact your practice for their dental work. 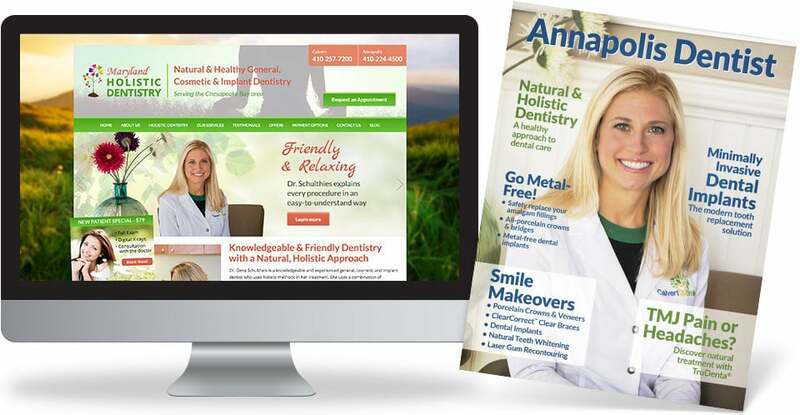 We can help you achieve your new patient goals with our marketing programs, including Internet and direct mail. We offer a Complimentary Consultation to discuss your practice goals and marketing objectives and to see which marketing would be most effective for your particular practice.